Sunday was our last day at the lake. Oh but don't you worry, we packed some fun into this day too! First up was a trip to a wonderful breakfast place called Toast and Jams. They even had homemade strawberry jam for your toast! I had the seafood scrambler and it was awesome! Then we drove back to the cottage. 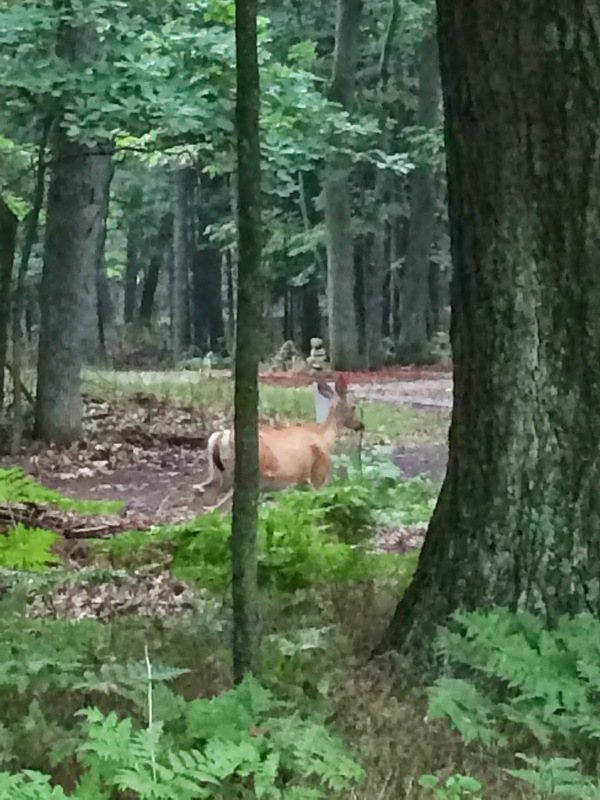 Every time we were there we saw deer at some point too. 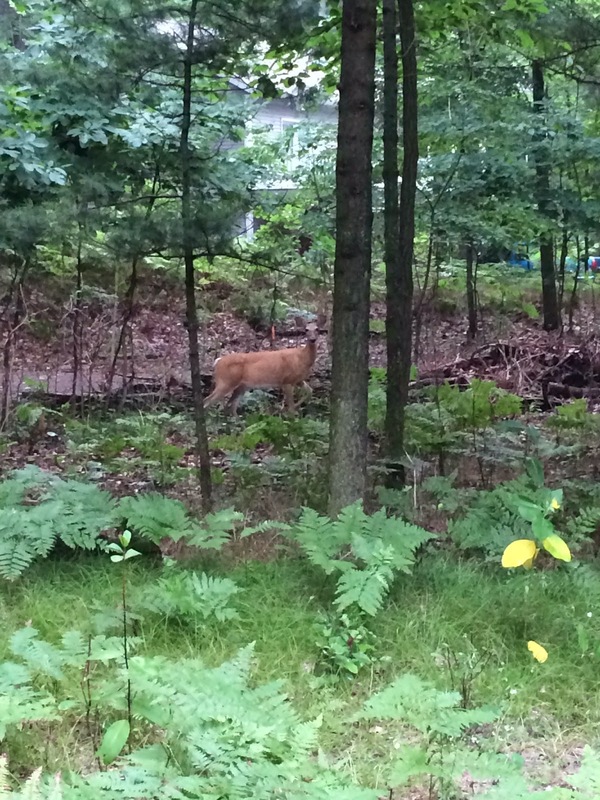 On Friday morning this was in the front yard. There was a mom and dad and 2 babies. After we got home I started stitching. 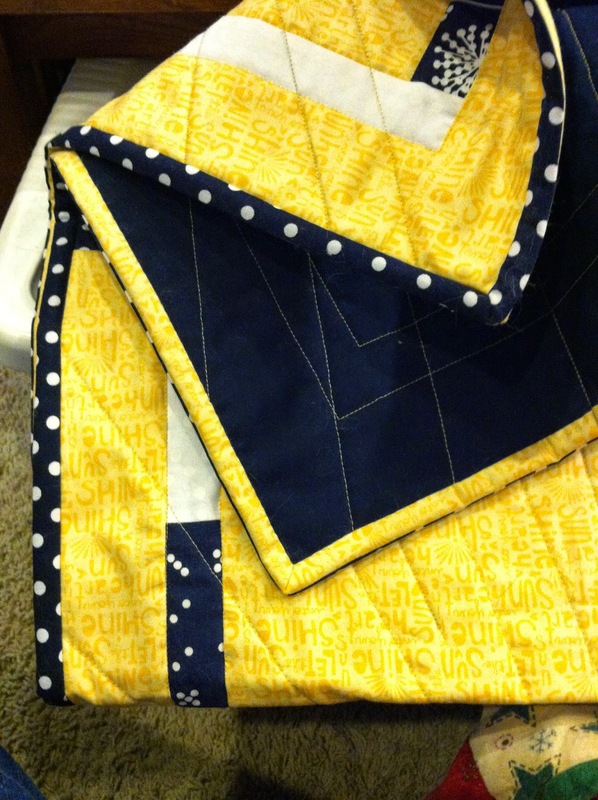 I really wanted to finish this part so I could begin the actual making of the mini quilt. It is now pressed and I will show you that tomorrow. My friend, Anne Neville challenged me to do the Ice Bucket Challenge. So I put on my swim suit and Ann and I headed to the beach. She gleefully (maybe a little too gleefully) filled the bucket up with ALL THE ICE in her freezer and then volunteered to go into the lake and fill it up with water for me too!! 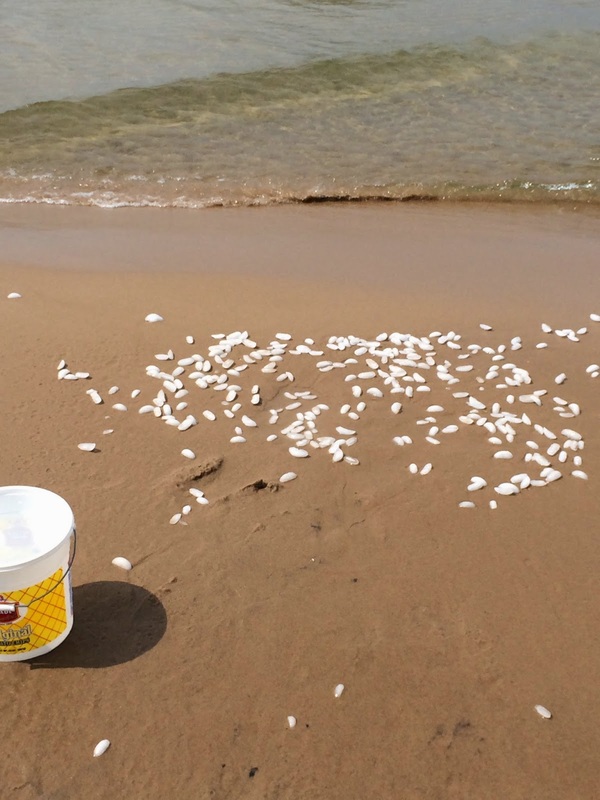 As you can see the ice all over the sand I did indeed take the challenge. I challenged three other people too. My Friends, Cori Jones, Jacquie Gering and Windy Sibberson. If you want to see the actual pouring of cold water all over myself you can view it on my FB page. 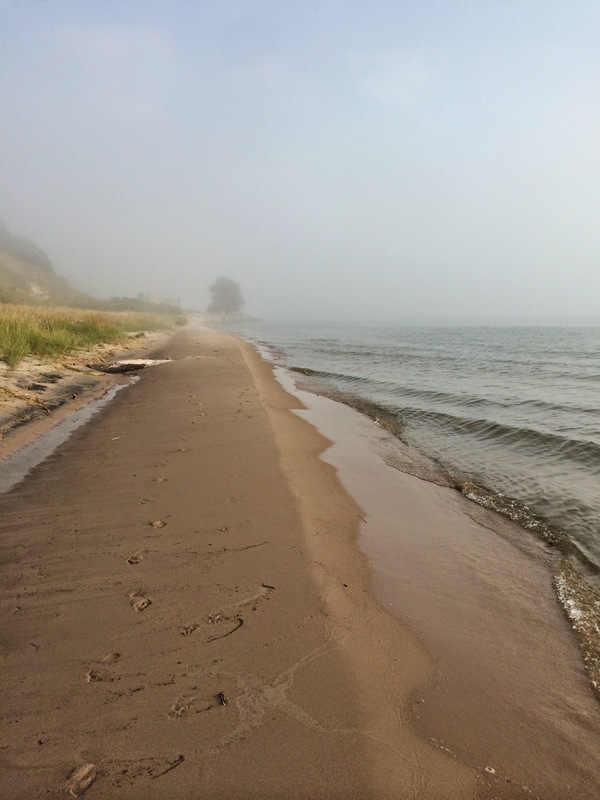 I then took the opportunity to go swimming in Lake Michigan. After all this excitement, we packed up and headed out. The drive should have taken us just under 3 hours and it took over 6!!! Thank you bridge construction at Lowell. It took us over an hour to drive less than 6 miles. I can honestly say I was happy to be home after that long, long car ride! Thanks to Ann for a GREAT weekend!!! I hope we get to do it again sometime. The fun of my weekend continued on Saturday. First thing in the morning Ann and I hit up the Farmer's Market. If you ever get a chance to go to this in Muskegon you should. It was one of the nicest Farmer's Markets I have been to. 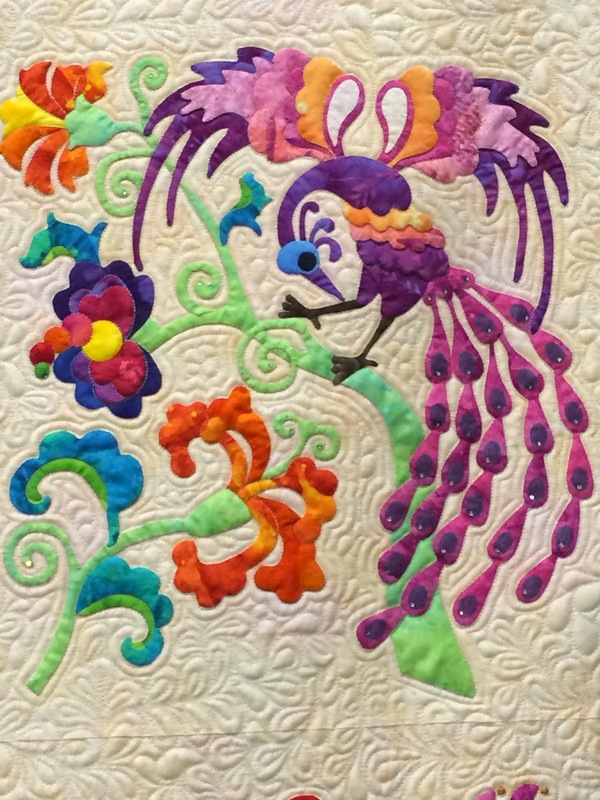 My friend, Windy, met up with Ann and I at the quilt shop in Holland, Pressing Matters. Ann was collecting the Row By Row patterns so I got them too. Plan on passing them along to another friend. I probably spent the most money at this shop filling out my Scrumptious stash. I ended up with this pattern as well. I thought it was so neat! It kind of reads like the Yellow Brick Road pattern. I'm not sure what fabric I will use in this but I definitely want to make it and soon! Then we headed off to a shop in Allegan, called Sharon's Quilts and More. I picked up some of my favorite needles, some Best Press and some Full Moon Forest!!! The next stop was a shop called Dancing Dogs quilt shop in Plainwell. This is the shop that Ann wanted to get the lighthouse Row By Row pattern at. Windy regaled us with stories of Plainwell as we were driving along. Next stop was in Kalamazoo at the Bernina Sewing Center. I think Windy bought some backing fabric here and Ann got a Michigan Tech pattern. We were pretty hungry so we decided to stop for lunch at Bilbos. Lunch was good and Windy had both of us laughing so hard with her bra fitting stories. I think the other folks in the place were traumatized, LOL!!! The final stop on our shop hop was in South Haven at So South Haven. I believe they are only open seasonally. Cute shop and the owner was super friendly! decided that we needed to stop in and have some ice cream. It was the Sherman Dairy Bar and the ice cream was fantastic! We were all pooped with our big travels of the day. We headed back to Holland and dropped Windy off and proceeded home to the cottage. 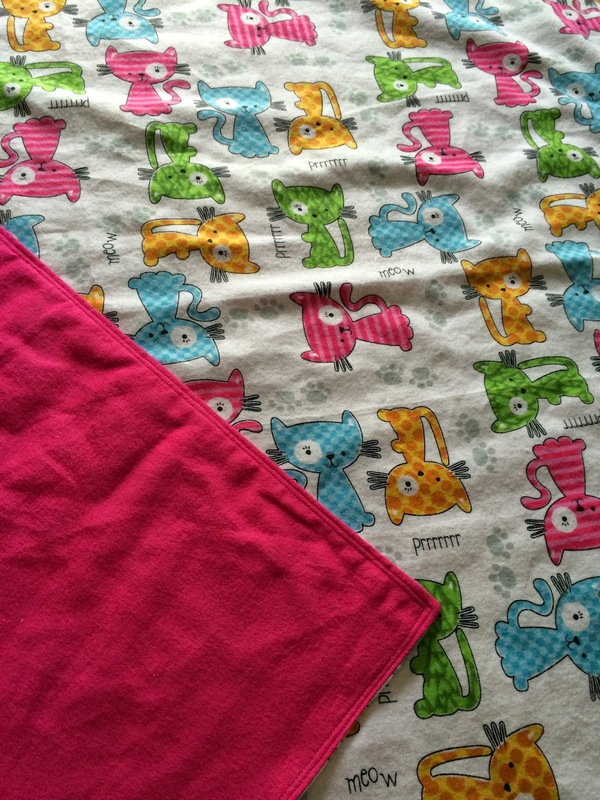 I did pull out my stitchery and got quite a bit done for the Kitty Mini Quilt Swap project. I will finish up the rest of the story tomorrow. 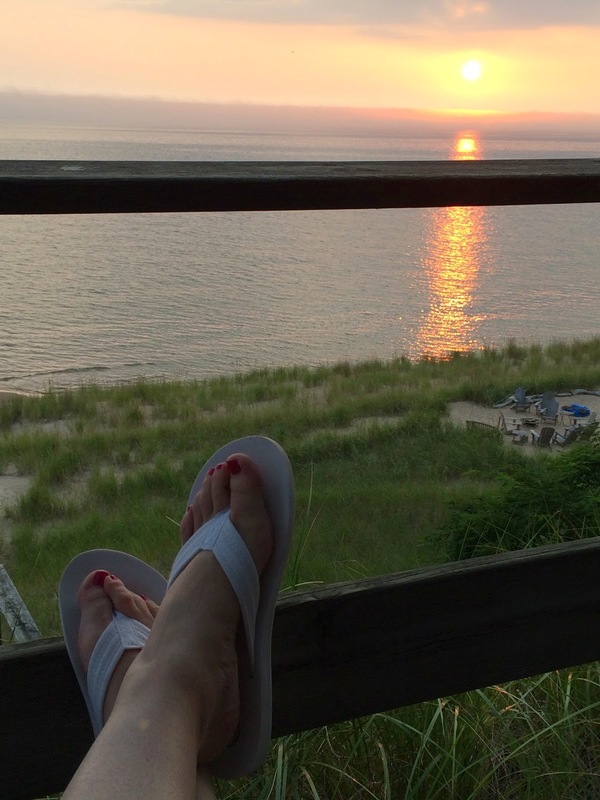 I got to spend the weekend with a friend at her cottage in Muskegon. She is right on lake Michigan! No kidding, you can see the lake from her house!! but it is well worth it! We went to the AQS show in Grand Rapids on Friday. I think we spent more time shopping at the show then looking at the quilts. Quite honestly I found the show a little disappointing. 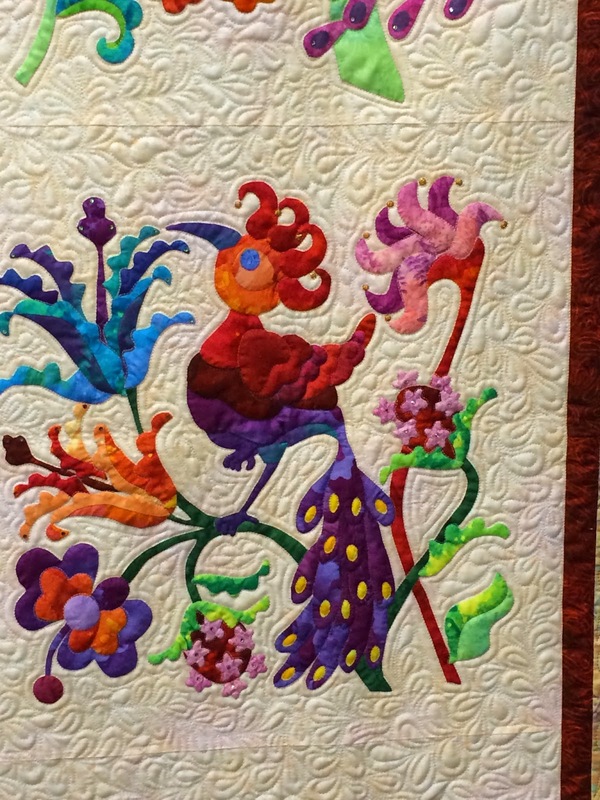 There didn't seem to be as many quilts that stood out to me as at other shows. My favorites were not the judges favorites either (big surprise). 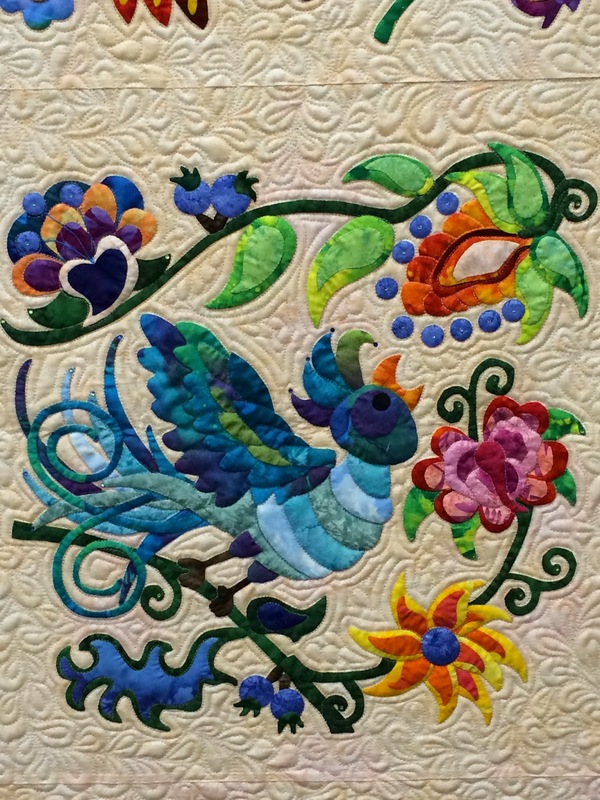 I did enjoy the challenge section, especially the birds from a group of quilters in Ann Arbor. 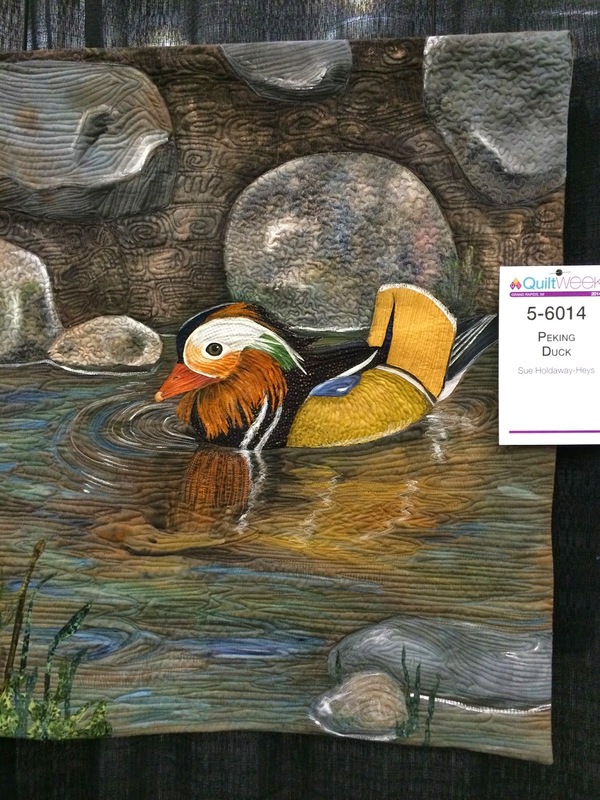 I especially loved this duck quilt. 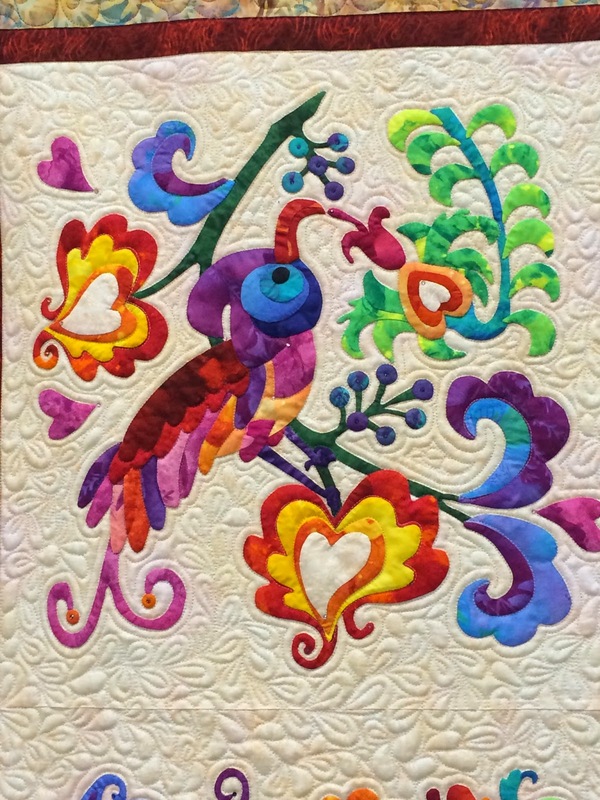 My very favorite quilt from the show was one of fancy birds. It was called Fantasy Fowl by Jerre Reese of SC. Here are some close ups too. I think this purple one was my favorite! While at the vendors I found a few things. A new iron. 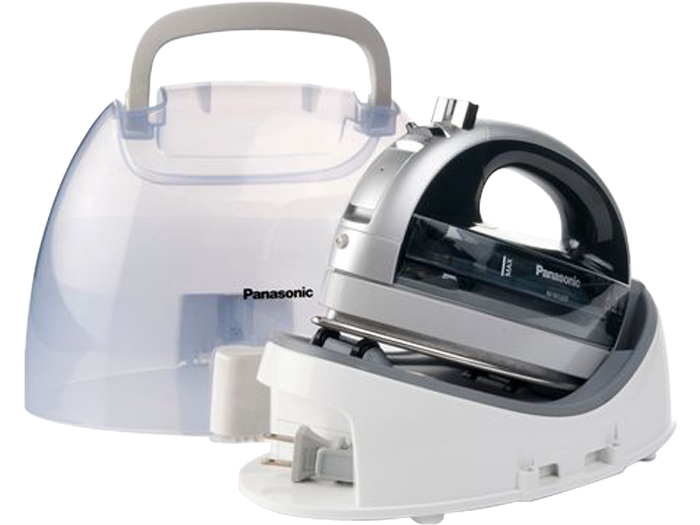 Freestyle by Panasonic. The AQS booth had them for around half price! Too good a deal to pass up especially with the glowing recommendation of my good friend Debbie! I bought a new ironing board cover too but no pictures to share of that! I got to demo the new Bernina long arm! I really, really want this!!! There are only 2 right now, one at Bernina USA and one at the show. It came with the table you see it sitting on. You can also get it with handles and the frame, but I don't have room for that right now. There was a show special and I was sorely tempted. All they were asking was for a deposit and the machines are not even out until April of next year. I told hubby that I bought it and it did not even faze him!! I think I need to keep him!! In the end, with all the house expenses, I left it at the show. I do see this in my future though. DD2 and I were talking about rings recently and she informed me that she would like an emerald with diamonds surrounding it rather than a plain diamond someday, when she gets engaged. I found this beauty while at the show too, it was an estate ring. It also stayed at the show. This was the only fabric I purchased while at the show. I needed some more royals for my Kitty mini quilt swap quilt. These were just what I had in mind! After all the walking around we were starving so went to the Blue Water Grill. I had this lobster sandwich and some root chips with their dipping sauces. I would highly recommend this place for a great meal! 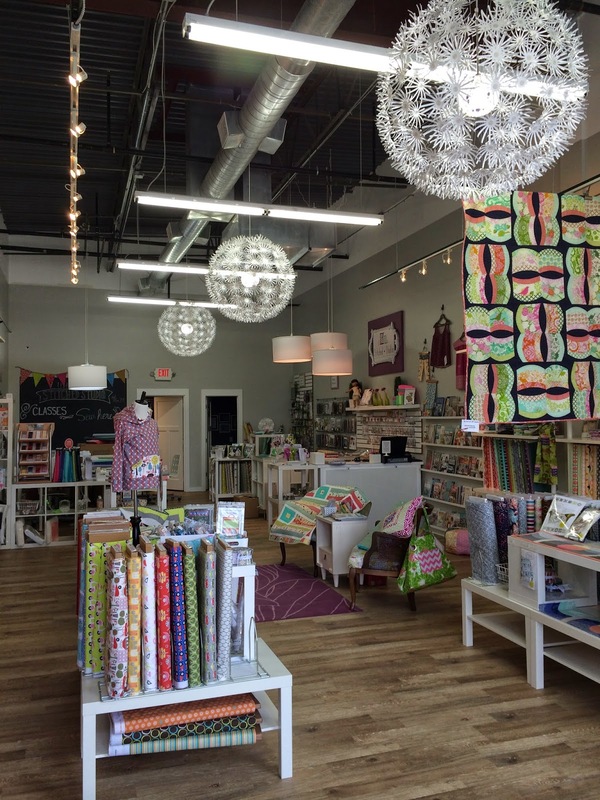 A new quilt shop in Grand Rapids. Cute shop and friendly people inside! Lots of great modern fabrics too. I was able to complete my Fox Field collection from this shop! We then headed home and walked down to the beach. It was kind of a gray day but lake Michigan is always beautiful! 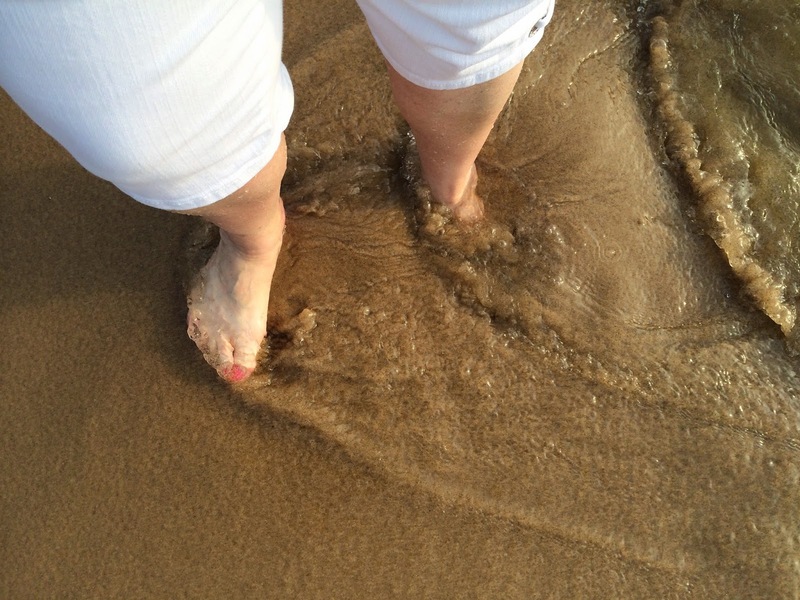 I just had to dip my toes in the water!! We watched the sun set and it was a good reminder that life is good! More about the weekend later! My FIL turns 80 in September. We had a party for him this past weekend. It was at my BIL's house on the lake which was nice. There are 7 kids in my husband's family and everyone was able to make it. Not all the grand children were there but all the children were. 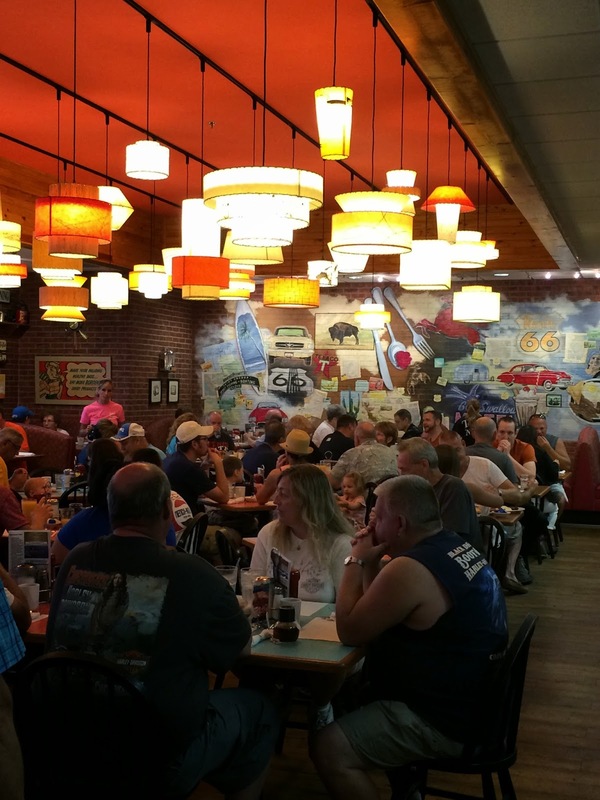 It is a big, crazy, fun family to be a part of. (even though it was supposed to be no gifts). You know, just something small. I found a great tutorial here on how to make wonky coasters and I was off. I had left over strips from the napkins so thought this would be a way to use some up. Here are the finished coasters. It took me about 2 hours to make a set of 8. I really love how they came out too! I joined the Kitty Mini Quilt swap last week and had to decide what to do for my partner. I finally narrowed it down and now have to get crackin! I traced my embroidery pattern out and made a few adjustments but last night I decided I needed to begin the stitching. Here is what I have so far. 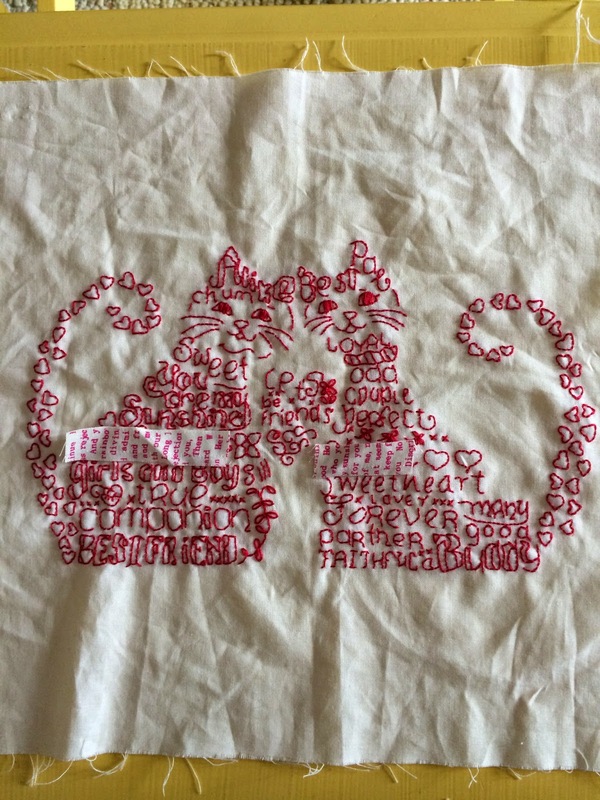 My WIP is to get this embroidery finished so I can put it into a mini quilt for my partner. I hope she will like it. I customized the design too but for obvious reasons I can't show you that since our partner is supposed to be a secret! 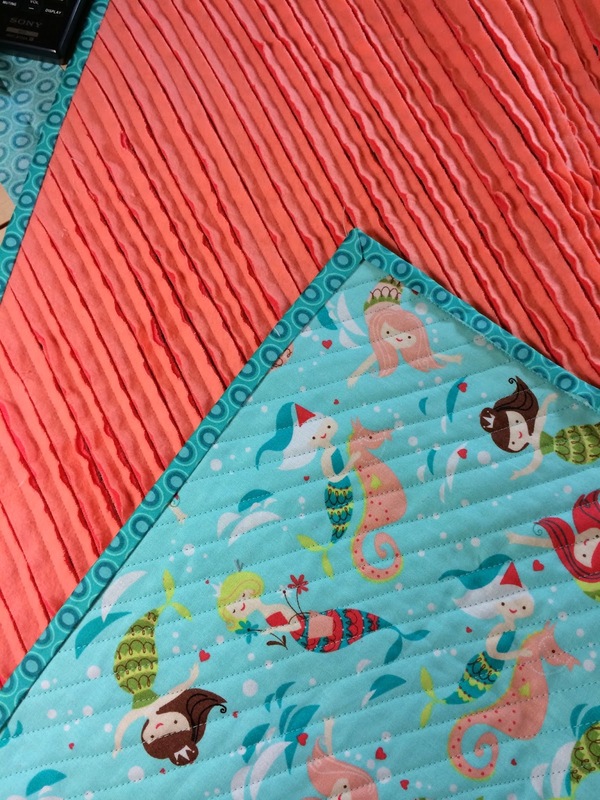 I am linking up to the WIP post over at Freshly Pieced. Go check out the other projects, maybe inspiration will hit you too! I finished the chenille blanket and put it into the wash last night. Such retro colors and I LOVE it!! Today is my 31st wedding anniversary too. Seems like just yesterday I was getting married to my best friend. Thirty one years have passed so quickly. Happy Anniversary to the best guy out there! I am pretty sure I have written about this previously but I think it bears repeating. I was putting binding on my chenille blanket. I was going to machine stitch the binding down rather than hand sew it. so decided to bust out the Elmer's washable school glue. Here is how I used the glue. First I attached the binding with my machine like you usually do. Then I pressed the binding away from the sewn line (toward the other side, to make for easier turning). Then I put down a thin line of glue. I turned the binding over the glue and using a hot iron pressed the binding down into the glue. 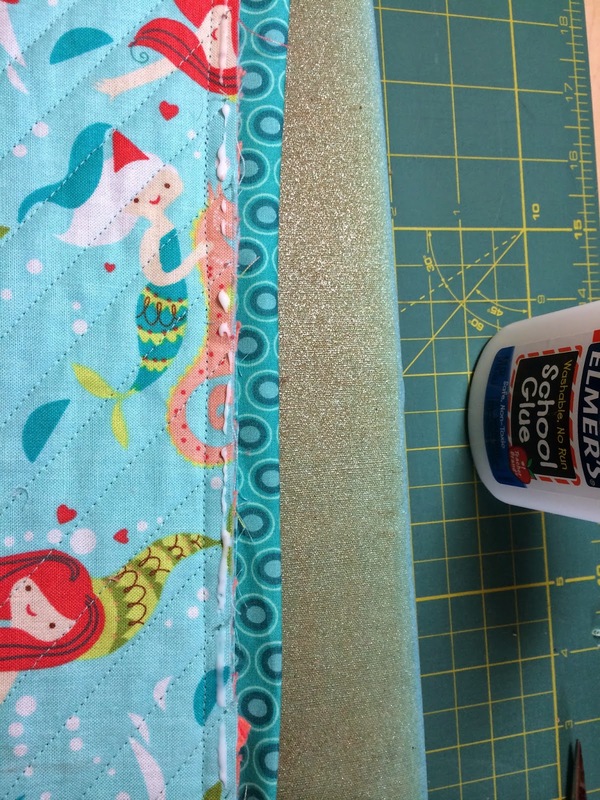 The heat will dry the glue and keep your binding in place. If you need to reposition you just give a tug, put down more glue, arrange to your liking and press. I did this all the way around the blanket. I began on a straight side and went until about 6" from the corner. The I put glue around the corner on both sides and made my miter. When I was happy with the positioning of the miter I pressed it into place. 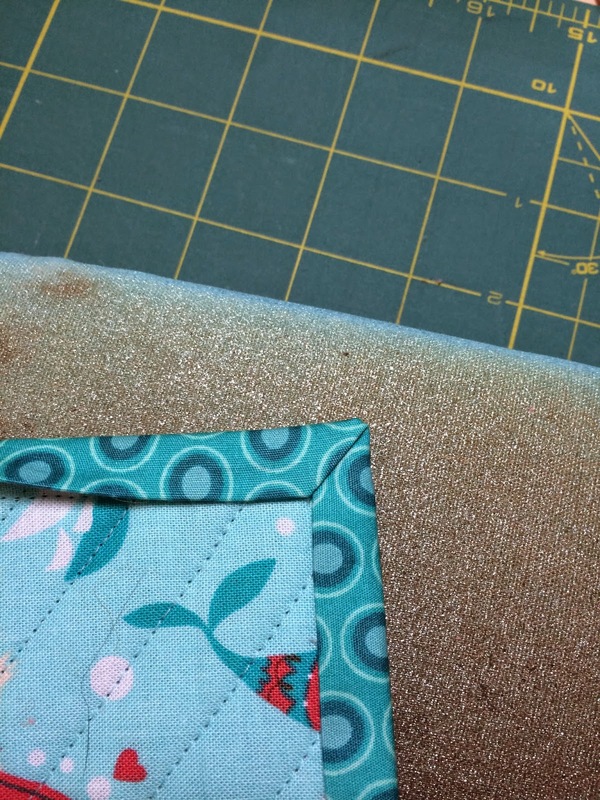 I used some beautiful Aurifil thread to topstitch the binding in place. my binding just barely covered the stitch line from attaching it on the other side. To give credit, I discovered this glue basting tip from Sharon Schamber on You Tube. You can watch how she does it right here. It really did not take any longer than pinning and I feel like it increased my accuracy. Please let me know if you try it and what you think. Also, with back to school shopping right now Elmer's glue is SUPER cheap so stock up!! Have a wonderful day and happy binding! I see the cutest, most adorable receiving blanket made out of 2 pieces of flannel. How fun would that be with a cute print flannel on one side and solid flannel on the other. Into the cart it went. This was super easy to make too. I took my yard of fabric and folded it in half once then again. 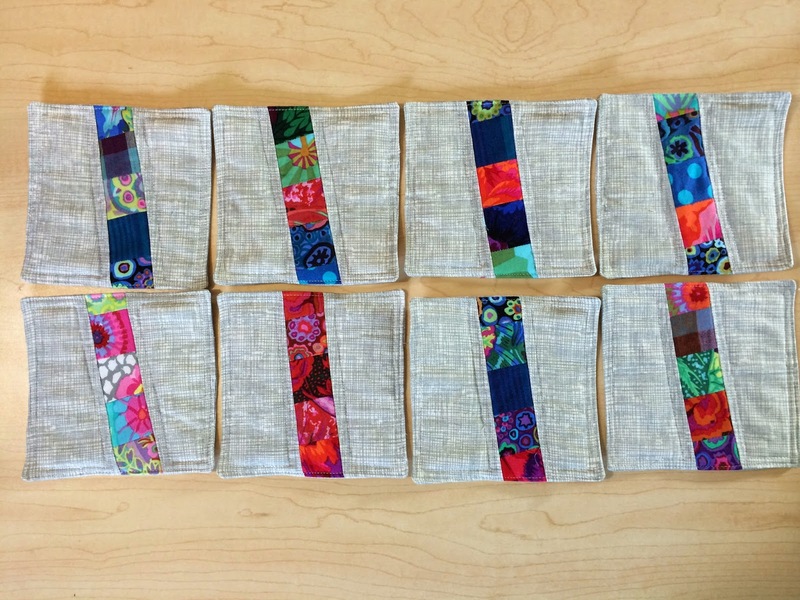 and lined up the folded edges. I then trimmed off the selveges and along the cut line so both pieces would be the same size. I unfolded them pinned them right sides together and sewed all the way around with a 1/4" seam, leaving an opening for turning. Then I topstitched twice all the way around (this closed the opening too!) and Voila! One super adorbs receiving blanket. You already saw the quilt, or part of it. but here is a sneak peek. I did a two color binding on this one too. 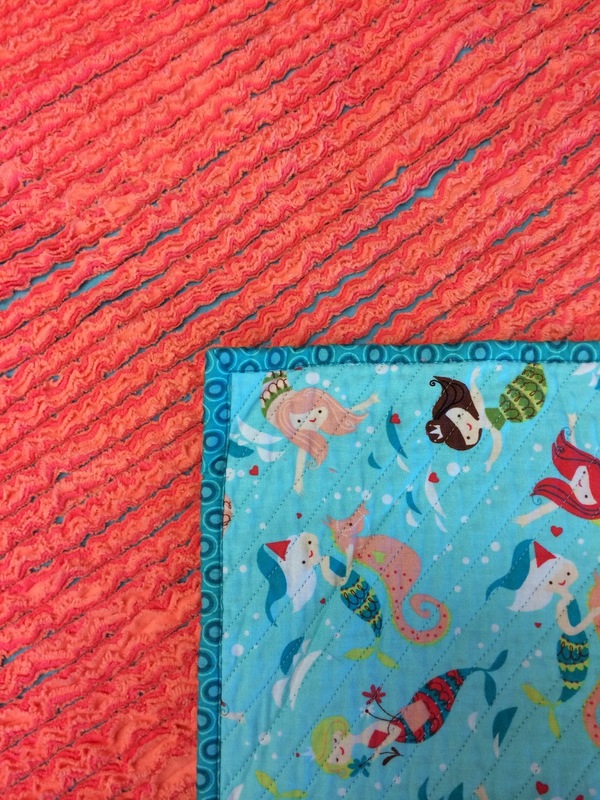 Lastly I had one chenille blanket made for her but while at JAF the super adorable mermaid fabric somehow found it's way into my basket! So I just had to pick up the flannel to make a more girlie version for this new little sweetie. I have not washed it yet but here is what it looks like pre-fuzz. OMG this is so sweet IRL! And that Art Gallery Oval Elements made the cutest binding. It reminded me of little life saver floaties, like you would use on a boat. 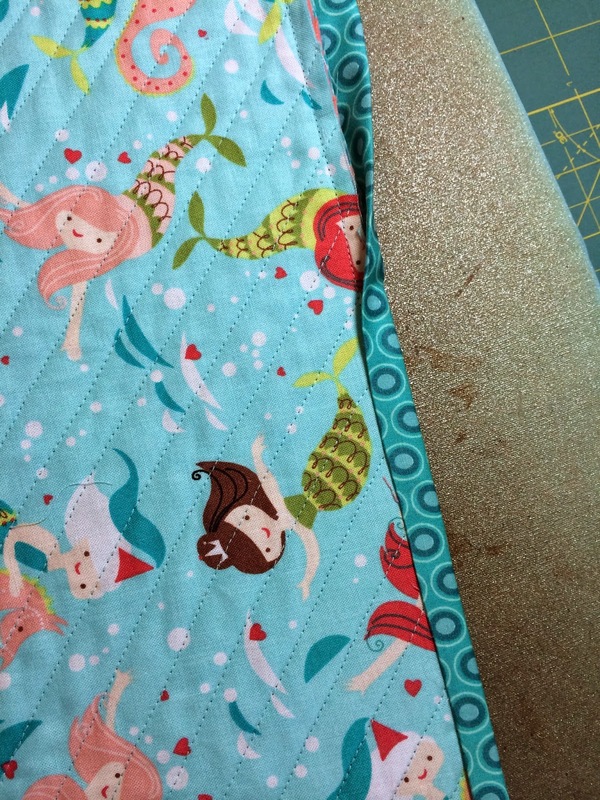 I had the perfect Aurifil thread color to machine stitch the binding down with too. I have a binding tip to share with you tomorrow. It made putting this binding a snap! Trying to decide if I want to do some appliqued Onsies too.